The reason I stopped the numbers at 99 is that scaling the font down is a little bit tricky (it was a corner that I cut in the hopes of getting the feature done sooner, but it seems more people than I expected want to map more than 100 locations). I will try to find some time to work on improving this. Created several maps, but when i try to view them nothing shows up? Still happily using your site.. Thank you. A suggestion for a minor fix.. Can you change the colors of one of the yellow bubbles? They’re so close together in color one of them is useless. Even if you just darken the darker one abit more. Also.. when you update things does our maps update automaticly or do we have to do something? Thanks for the suggestion, I will revisit the colors sometime soon. The change will affect all maps, so you won’t need to do anything to get the new color. How do I print a map off??? I know that you mentioned that you added numbers to the location markers, which is great, and what I was looking for so I can easily pair up the location with the information in the table, but when I run a map it doesn’t have location numbers. Is there a trick to changing them to numbers? Did you go back to just plain color markers? Thanks! Patrick I was hoping you can explain to me how to edit a point on and existing map. I click on my maps and then edit and I am not able to change anything but the color of the marker icon. Currently, you can’t edit a point (except by deleting and re-adding it). I have most of the work done to add this missing functionality, and I hope to finish it soon. You need to save the map, and then the markers will turn from dots into numbers. To print a map, you can use your browser’s built-in print functionality. You may need to adjust the zoom level and/or move the map a bit to ensure all of the locations are visible (because printer paper and computer screens are generally a different shape). You can use the print preview feature to help with this, so you don’t have to waste paper. You can also use the print-to-PDF functionality if you want a PDF copy of it. I think mapcustomizer.com is a great site! I would want to know though, if there is a way to disable the scroll zoom on the map. How can I embed my map into a blog post or in a mail chimp campaign? Hope you can direct me! It isn’t currently possible to disable the scroll zoom on the map. That is a feature that comes with the Google Maps product that I am using, so I would have to investigate to see if it can be disabled. Embedding maps from my site directly on your blog or mailings isn’t supported, but you are welcome to create a map and link to it from your site or mailing. Is it possible to predetermine the color of the pins prior to uploading the addresses? Or, is it possible to change the color of a group of pins all at once? I am looking for a way to visualize different groups of address data. It isn’t currently possible to specify the marker color in the bulk entry, or to bulk-update the markers. It is something that a lot of people have asked for, though, so I hope to add this feature soon. The site is down right now. Is there a serious problem? I had some maps I’d be needing to Access. hey the site is down, is it coming back? btw great work with the site! 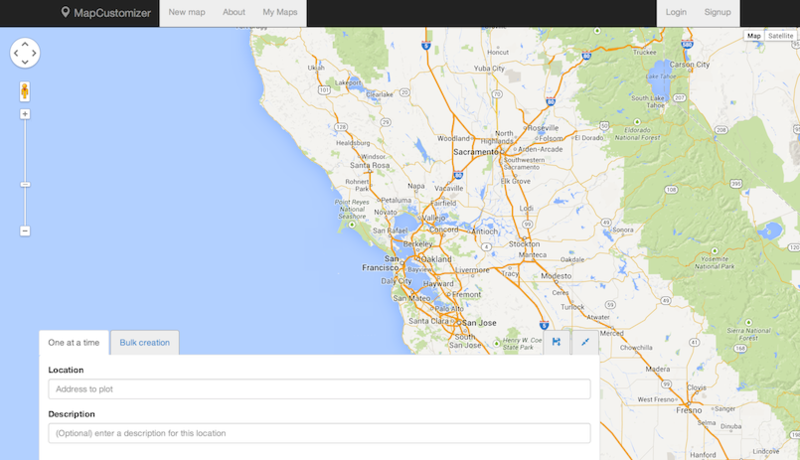 mapcustomizer appears to be down, error 521,,,’web server is down’, do you know when it’ll be up and running? Great site! Hi @Ekin, @Blazej, @keith the site is back up now. Sorry for the inconvenience! Great site…would love to be able to pass parameters and open it up. Can you help with this??? If I missed this I apologize, but I did not find it anywhere. Fantastic site. Would love to know if there is a way to bypass the cut/paste of the address and have the site interact with a db. I have several address that I would like to have plotted, but I would love to double click on a button and have the info pop directly on the site. This is the second time I send this, so please forgive the spamming. Fantastic job! Exactly what I have been looking for. Expert execution! I entered a bunch of addresses in a random order, and will add new addresses along the way. However, I’d like to be able to arrange the addresses, so that when I see the list of addresses, they are “clustered” together. It looks like the default is to number and list the entries in the order they were entered. I tried to rearrange the numbers and order through the “EDIT” menu, but was unsuccessful. Please advise. I greatly appreciate your help. this site is awesome and a great tool. However, the only thing I miss is the possibility to calculate a route or at least distance from one point to each of the others. I understand if this is difficult, and that there are loads of other things to implement before this, but I think it could be a useful feature for a few other as well. With that being said, I found your map very helpful when looking for apartments close to work in a city I’m not familiar with. Have not seen a reply regarding the concept of loading multiple addresses from a db. Still would love to be able to accomplish this via the MapCustomizer.com site. I have a local db that could generated the needed addresses, but would love to know if there is a way to ‘feed’ the data to the site via XML or other like format/method. Tom- Thanks for the suggestion about passing in addresses as query parameters. A few people have asked for that in the past. It gets tricky when you get near the limit of the length of a URL… and that limit is poorly defined and varies from browser to browser. 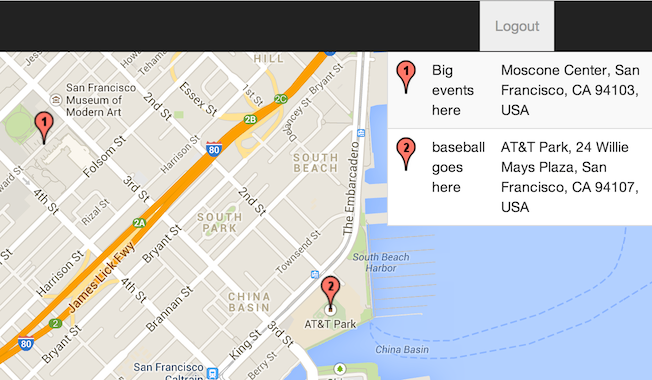 I have also been thinking about offering API access to allow you to create maps programmatically. Not sure how/when that will work out. Patrick– Yeah, re-ordering the points is high on my list of improvements for the site. I hope to have it ready soon. Michael– When you print, the location list should appear below the map, which might help? You will probably get a few locations listed on the first page below the map, and the list will continue on subsequent pages. Hi Patrick! Is it already possible to add a color tag behind the address line? Thnks again for your great site! Is there a way to get a confirmation before deleting a pin point if you accidentally click on the “X” for that point? I was using MapCustomizer yesterday and it has been very helpful with a current project. Today I created a new map and although the points are showing up during the ‘edit’ screen, when I ‘save’ there are no points plotted. Do you think this could be a problem with my browser or the site itself might have had a hiccup? Please advise, I love the site and want to keep using it! It should be back up now. Please let me know if you run into any problems. HI Patrick, so far I think this site is great. I have multiple maps made and use it daily. Also thanks for adding the trash can and edit buttons. I see where you said the site would be back up on the morning of 11/24/15, however it is still down. any knowledge as to when it will be back? I’ve been using the website for a few days now and registered yesterday. It works really well. I noticed it hasn’t been working this afternoon. Do you have an idea when it should be working again? Hello, I haven’t been able to get into my maps this afternoon. I’m receiving a ‘503 service unavailable. no server is available to handle this request’ error. Just learned of the website, but appears to be down again; server issues? I was having some problems with the site over the past couple days, but everything seems to be stable now. Sorry for the inconvenience! I see on Nov. 25th that you noted the site is back up again, however, I have been trying to access it today and over the weekend, but I am getting a “503 Service Unavailable” message. Do you when this will be resolved? We are trying to map out our stops for our food bank so we can optimize our deliveries. This tool has been invaluable for our mapping. Is there any way to get the points to be numbered so that points in the same county will be numbered together? Sorry to keep complaining about a free service but the site is down again. It seems like there are a lot of outages here lately. Is this something that that we should be concerned about? Or will this be fixed soon? I”m bummed your map is down again. It was down last night, up this morning down again. I depend on it to plan for my part time job and therefore have contributed a couple of times. The new changes reminded me I should contribute again & then the site went down. If a little more money would get a more stable site I would be happy to send a little each month. Sorry for the inconvenience this caused. I have been having some issues with the site, and they happened to coincide with some family changes that have made it difficult to make some time to fix the site. I believe I have identified the cause of the problems and fixed it now, though. I am continuing to monitor the site to try to keep it running. The order of the locations should be preserved when you use the bulk importer (previously, there was a bug that caused this to not be true). You can also now reorder the locations in the listing (which will change their numbers). Will that work for you? When you say ‘the app crashes’, do you mean IE crashes? Or is there some other app you are using? I don’t think there is any way to directly save the map as a JPG (except perhaps by taking a screenshot), so I’m not sure if I am understanding the issue correctly. I’ve been using mapcustomizer for a few months now and suddenly one of my maps will not open when I try to edit. All that appears is the list of locations to the right but the actual map never appears. It used to appear up until recently. If I choose view, the map appears. Also, I have a second map that I use and it functions properly with the map appearing when I select edit. Any idea what would cause this and how to fix it? I am aware of an issue like what you are describing with very large maps (more than 1000 locations). I’m working on a fix, but I don’t have it ready yet. Is your problematic map large?